Registration for our next sessions of Puppy and Beginner Obedience ends April 2nd. (All documents and fees are due at time of registration.) Our next classes begin April 9, 2019 (weather permitting). Beginner is 6:00 p.m. and Puppy Kindergarten is 7:00 p.m. at a cost of $120 for an eight week course. Complete registration agreement may be downloaded or online form is available at the very bottom of this page. Fees, proof of your dog's vaccination and worming and a fully completed application are also required at the time of registration. Registration closes one week prior to the start of classes. Subject to meeting minimum class size. Novice, Open and Utility Classes run year round on Wednesday evenings at a cost of $12 per hour. If your dog has completed basic obedience and you are interested in attending, please complete the form at the bottom of the page and provide vaccination proof before attending the first class. Call for information regarding times and availability of these classes as well as for Rally Obedience and Conformation. Private lessons are $65 per hour by appointment only. Call 815-362-2045 to schedule an appointment. We offer group training, hourly training and private lessons. Beginner - For dogs at least four months old. Classes cover heeling on a loose lead, automatic sits, changes of direction, figure 8 patterns, stand, sit and down stays, coming when called, etc. We will also work to resolve any established problem behaviors and how to prevent problems in the first place. Novice/Advanced Novice - For dogs who are working both on and off lead. Novice works on perfecting reliability both on and off lead. Advanced prepares you and your dog for competition in Novice as well as introducing some Open and Utility level exercises. We do proofing for distractions in all of these classes. Open - For dogs who have completed their Companion Dog Title and are advancing to the Companion Dog Excellent Title. Off lead heeling, drop on recall, retrieve on flat, retrieve over high jump, broad jump and out of sight sits and downs are covered as well as introduction to all levels of Utility. Utility - For dogs who have completed their Companion Dog Excellent Title. Finishes training for the Utility Dog Title. Rally - We offer both AKC and UKC Rally. Dogs must have basic obedience training. Handlers learn to take their dog through a course of signs, completing each exercise without further direction. Verbal encouragement and extra gestures, etc. are allowed throughout the course. All three levels of classes are offered. Conformation - Conformation classes are currently offered by appointment only. Please see Private Lessons (below) for fees and how to schedule an appointment. Private Lessons - Private lessons are scheduled by appointment at $65 per hour. We cover all problem behaviors as well as preparation for competitions. Call 815-362-2045 to schedule an appointment. What class are you applying for? Where did you hear about these classes? Who is responsible for care and feeding in your household? If your dog has a problem with a more specific situation, please describe it here. If not, leave this blank. Where was the dog obtained? 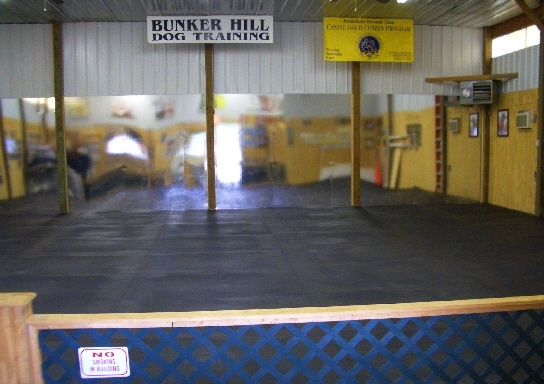 AGREEMENT: I (we) fully understand that I am responsible for the control of my dog at all times while on the premises of Bunker Hill Dog Training. I agree to hold this business, its owners, directors or agents harmless from any claim for loss or injury which may be alleged to have been caused directly or indirectly to any person or thing by the act of this dog while in or upon the premises or grounds or near any entrance thereof and I (we) personally assume all responsibility and liability for any such claim and I (we) further agree to hold the aforementioned parties harmless from any claim for loss of this dog by disappearance, theft, death or otherwise, and from any claim for damage or injury to the dog, whether such loss, disappearance, theft, damage or injury be caused or alleged to be caused by the negligence of any of the parties aforementioned, or by the negligence of any other person, or any other cause or causes. I (we) hereby assume the sole responsibility for and agree to indemnify and save the aforementioned parties harmless from any and all loss and expense (including legal fees) by reason of the liability imposed by law upon any of the aforementioned parties for damage because of bodily injuries, including death at any time resulting therefrom, sustained by any person or persons, including myself (ourselves), or on account of damage to property, arising out of or in consequence of my (our) participation in this class howsoever such injuries, death or damage to property may be caused, and whether or not the same may have been caused or may allege to have been caused by negligence of the aforementioned parties or any of their employees or agents, or any other person. I agree to abide by the Rules and Requirements and I have received a copy of same prior to signing this agreement. I understand that the registration fees are non-refundable. I agree to the terms as provided in the Agreement above. ANY PARTIES UNDER 18 YEARS OF AGE MUST BE ACCOMPANIED BY A PARENT OR GUARDIAN WHO MUST ALSO ATTEST AND AGREE TO THE AFOREMENTIONED STATEMENTS. THE PARENT OR GUARDIAN WILL BE HELD RESPONSIBLE AND LIABLE FOR THE MINOR'S CONDUCT AND SAFETY WHILE ON THESE PREMISES.